Hornithology includes the premiere recording of Gunther Schuller’s Five Pieces for Five Horns and includes the world-renowned and enduringly brilliant master technician, Barry Tuckwell. 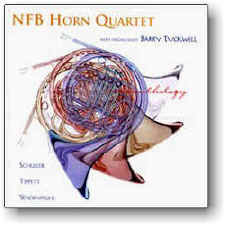 The NFB Horn Quartet, comprised of accomplished musicians who first met as students of the the legendary John Barrows, “sets a new standard to which all others should strive” (John Williams, Boston Pops Orchestra). The late Sir Michael Tippett is widely regarded as one of England's finest composers. Sonata for Four Horns is an exuberant tour de force that also creates, at times, a languid, mysterious ambiance. Recorded on May 27 & 29, 1993 at the Campion Center in Weston, Massachusetts.